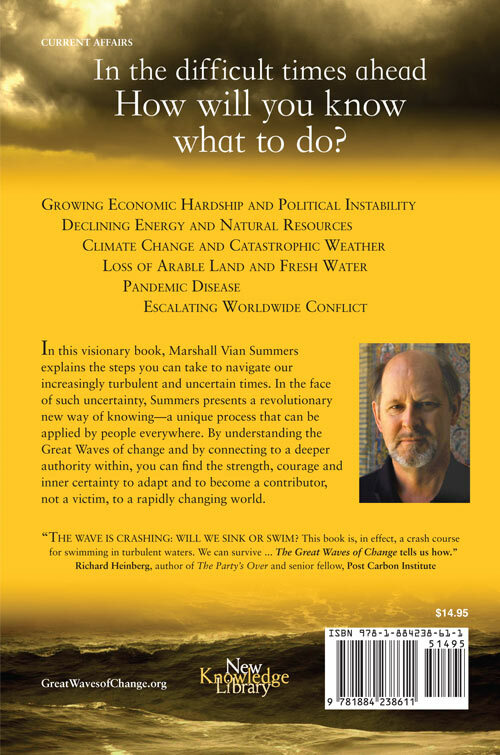 In The Great Waves of Change, Marshall Vian Summers explains the steps you can take to navigate our increasingly turbulent and uncertain times. In the face of such uncertainty, Summers presents a revolutionary new way of knowing a unique process that can be applied by people everywhere. By understanding the Great Waves and by connecting to a deeper authority within, you can find the strength, courage and inner certainty to adapt and to become a contributor, not a victim, to a rapidly changing world. CHAPTER 11 Where Will You Place Your Faith? A masterpiece of perspective in our changing and dangerous times. Marshall Vian Summers speaks with refreshing authority and sobering truth. The Great Waves of Change eloquently addresses the clear and present dangers of our current age while outlining a grounded vision of hope and promise. The increased sense of security and piece of mind I feel after absorbing the message given is a testimony to its relevance. In looking into the events that led Marshall to harness such a voice, I am very satisfied that this is a genuine voice and represents the greatest minds among us, seen and unseen.